Home demolition photograph provided by Price Hill Will. In September, city officials stood in Price Hill alongside state officials to announce plans to demolish up to 700 vacant and blighted buildings in Cincinnati. The funding for the ongoing effort comes from a state-wide program called Move Ohio Forward, which gives demolition funding to cities from money the state won in a settlement with large banks last year over the home foreclosure process and lack of property upkeep by the banks. City officials estimate that there are currently 1,300 vacant and blighted properties awaiting demolition. The $5.84 million grant, when matched with $5.34 million from the Hamilton County Land Reutilization Corporation and $3.49 million from the City, will provide enough funding to cover just over half of the total amount of demolitions mandated its own ordinances. The final amount of demolitions, officials say, will vary from neighborhood to neighborhood. “The Moving Ohio Forward Grant Program provides unprecedented blight abatement opportunity for the City to clear dangerous, obsolete buildings from neighborhoods, make way for redevelopment, and eventually raise property values,” Edward Cunningham, Property Maintenance & Code Enforcement Division Manager, told UrbanCincy. In an effort to further control what happens with the cleared sites, the City of Cincinnati will work with Hamilton County’s new Land Reutilization Program in order to acquire tax delinquent properties. Once the buildings are demolished, the City will determine if the land can be used as parks, community gardens or rehabilitated into new housing. So far, however, only enough funding for lot restoration on 200 parcels has been identified. In cases where the lots are private properties, and are not able to be acquired, it will be up to the property owners of the vacant lots to decide the future of their property. According to Cunningham, property owners will be allowed to maintain the lots, create parks, parking or new infill construction. 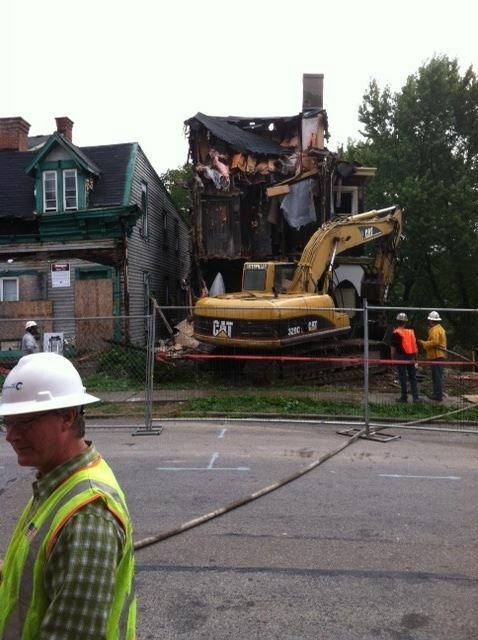 Property demolition has been used by many cities including Cincinnati as a method of addressing problem vacant buildings that have been condemned because they are hazards to human health and unsafe to occupy. While the debate on the impacts of foreclosure and vacant property is far from over, some of these buildings are “too far gone” in the eyes of building inspectors that they legitimately need to come down. And according to Cunningham, the buildings being demolished under this program are buildings that are beyond repair. Once the demolitions are completed, one-by-one, it will create more land between occupied houses thus negatively impacting the completeness of the neighborhood’s form. Without a strategic plan, vacant and unmaintained lots could end up degrading neighborhoods in the same manner as blighted homes; however, vacant lots tend to be easier to maintain and do not pose as much of a risk as a standing structure. Furthermore, demolitions made through this program on private land will place the cost burden on the property. Should the property owner not pay the assessment for the work, then the property could be foreclosed by Hamilton County, which would then open the land up to redevelopment. This process, however, does take a considerable amount of time and offers no guarantee of redevelopment. 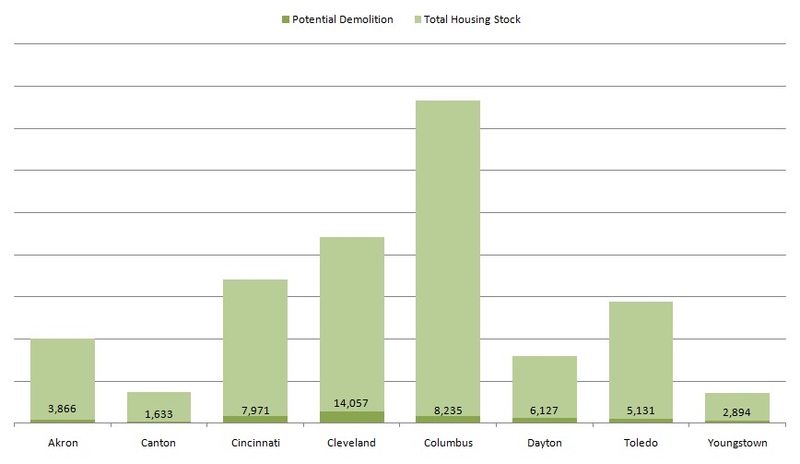 Projected Housing Units in Five Year Demolition Pool by City for Ohio’s “Big Eight” Cities. Source U.S. Census Bureau. The challenge of increasing amounts of abandoned and blighted housing is not symptomatic of Cincinnati alone, as many older industrial cities are facing the similar problems. A recent report from the Brookings Institute found that Cincinnati might have close to 8,000 buildings eligible for demolition in the next five years. The report also stated that while the demolitions have the potential to stabilize neighborhoods, excessive regulations and costs prevent cities from demolishing the amount of housing that should be demolished on an annual basis. To overcome these hurdles the report makes a series of recommendations for cities to devise their own strategic demolitions plan. “Planners, urban designers, and residents must together evaluate how demolishing a particular building will affect the texture of its block or area,” the Brookings Institute stated in Laying the Groundwork for Change: Demolition, urban strategy, and policy reform (2012). Cities such as Cincinnati need to have a level of transparency in place that allows for neighborhood input on the reuse of the newly created vacant lots. It is not merely enough to encourage neighborhoods to help identify future uses for vacant lots as the city is doing now, it should be required. As previously profiled on UrbanCincy, Cincinnati’s population decline is systemic and although vacant building demolition is more a testament to the large supply of housing versus demand, absent a strategic demolitions plan, the city should be mindful that stabilizing neighborhoods relies heavily on preserving existing housing or building new housing capacity and offering incentives or neighborhood upgrades that would attract new residents. Next articleWill Cincinnati hit another home run with Tower Place redevelopment?